For decades now, we have been provided with folders to manage our accounting files. A hierarchical storage model that panders to that bit of control freak in all of us – or not. They are actually a little unnatural, (teaching people how hard disk/folders work was not an easy task and the older generation have grown up with nothing else) but still are now so very deeply engrained in our culture that we can’t let go; so much so in fact that new offerings in the cloud such as DropBox and One Drive offer the same model. We see a company name (client), a year, a service type and an employee mentioned, but now we cannot properly sort or filter by these because they are simply buried in a string of letters and may be misspelled or misarranged. How do you know if an invoice has come in or been paid? A human can make educated guesses – but don’t let a computer make them on their behalf! This financial data is all but lost in this new world of big data. Secondly it takes effort to manage and extend the folders. With each New Year, client, supplier, new folders need to be created by hand. The data for these probably exists in a finance system, but they might not be used or worse, ignored. This lack of integration between systems and folders severs any form of structure and renders the folders chaotic. Just ask yourself about the lumbering, enormous file shares you have in your financial department that you cannot bear to navigate yourself – can you link to them from your systems? Probably not. Finally – the reality of so many file shares are that they are simply not searchable in a useable manner. This problem is increasing at an exponential rate as the amount of data businesses are holding continues to grow. DropBox, One Drive and the others – Spreading the misery, Simply. Many of us are enjoying the simplicity of sharing via DropBox. We are seduced as it appears to work, but what is really going on is the chaos of our folders is being replicated and shared on a new, larger scale. Those of us that use DropBox a lot start to see the cracks in the system – overwritten files (poor versioning) and unclear ownership of data. It only takes a few disappointments and the service starts to lose its shine. The result from a business overview perspective is worse: collaboration is happening in the business but now there is no clear view or strong control over the majority of key business data. Unlike folders, key data about a file or document (known as Meta-Data) is defined explicitly for what it is – this enables the powerful search and meaningful navigation you enjoy on the Internet. Dates can be dates that you search for before and after, numbers have order and range, staff names must be in a valid list. What is also different is you can choose to constrain what values are included in this data and if it is required or not. 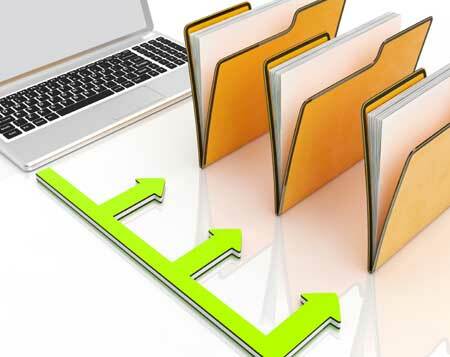 Integration of documents with systems becomes achievable and rather easy to manage. The result is that you have a far better organised set of documents that can be retrieved instantly in the way you really want to. We still want to be able to control data and compartmentalise it, but we don’t need to create a thousand folders to achieve this – just a handful of partitions for secure access would do nicely, thank you. All users are happy with search at home. Many are now using search at work and the number is increasing. Mobile devices have taught users that the hierarchy of folders is not the only way to manage data. IT managers are looking for ways to shut down these dinosaur file shares that add little value. Compliance managers are demanding true visibility and enquiry into documents held in the business. Ops directors are demanding better integration between systems and documents. All these factors pointedly state that the era of the folder system is all but dead. We just have to wean ourselves off it!